A mural from the Dura Europus Temple, a Jewish temple built overlooking the Euphrates River around 220 A.D. and recently unearthed. This mural shows Aaron beside a permanent temple (with Corinthian columns!) but the drapery references the Tabernacle. 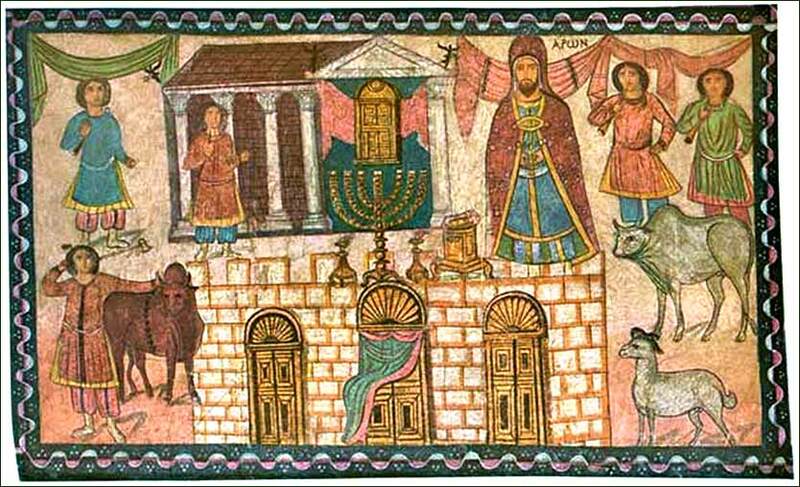 In front are various items of furnishing described in Exodus 24-27, sacrificial animals, and men with trumpets. A pretty, soft song from talented songwriter and performer, Michael Ortega. 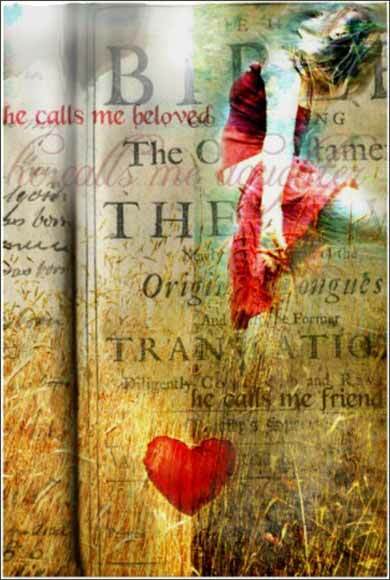 He Calls Me Beloved by Stacy Lee, contemporary. “You shall make the altar of acacia wood, five cubits long and five cubits broad. The altar shall be square, and its height shall be three cubits. And you shall make horns for it on its four corners; its horns shall be of one piece with it, and you shall overlay it with bronze. You shall make pots for it to receive its ashes, and shovels and basins and forks and fire pans. You shall make all its utensils of bronze. You shall also make for it a grating . . . .
You shall make the court of the tabernacle. On the south side the court shall have hangings of fine twined linen a hundred cubits [about 150 feet] long for one side. Its twenty pillars and their twenty bases shall be of bronze, but the hooks of the pillars and their fillets shall be of silver. . . . The altar was fundamentally a barbecue grill almost eight feet square. At different times and in different ways, the Old Testament teaches both the Hebrews and us an important, and often difficult, truth: God gave us life and He will not hesitate to take this life away. Our lives are His to take, if we offend Him, and He will allow the sinful to die (or, sometimes, kill them Himself). If we have sinned, the only way God will allow us to live is by redemption: something must die in our place. This may not make complete sense, it might not be how we would do things, we might not think it is fair — but there you have it. One of the great themes of the Old Testament is redemption by substitution. God decrees that the Hebrews may offer the life of an animal to redeem their own life. The laws of sacrifice are often quite specific. Some offerings to God are sacrifices for redemption, although some are simply gifts of thanks. In most cases, either the person making the sacrifice or the priests, or both, are allowed to eat part of the sacrifice, to share with God a meal of joy that the offeror's life has been redeemed. Moreover, we see that worship is a community function. The primary worship is not done at home by an individual or family, but in public. There is one central altar for sacrifice. It is located in a great courtyard in front of the Tabernacle proper, to accommodate a crowd. Finally, God never sleeps and His door is never closed. A lamp inside the Tabernacle was lit with the purest olive oil, to produce the cleanest flame they could manage. It was the duty of the priests — Aaron and his sons — to make sure that the lamp never went out at night. This symbolized that God's light was upon the Hebrew people at all times, from the sun by day and a special lamp by night, just as the light of His spirit is now upon us without ceasing.